Mariah Freda, Arisael Rivera, Brian Demar Jones, Brianna Kalisch, and Alexandra Bonesho, in The Anthropologists Save the World. BOTTOM LINE: A commentary on our technology dependence and our addiction to unhealthy habits and foods. Artistic Director Robert Lyons presents the 24th-annual Obie Award-winning Ice Factory Festival, in which The Anthropologists Save the World! is proud to take part. Part play and part performance art, it is a statement on humanity and the way we exist on this earth. From climate change to technology, the human race is killing the planet and this production is here to educate and entertain us on the subject. 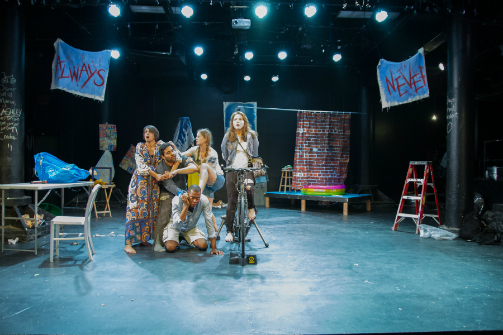 The Anthropologists Save the World!, conceived by the ensemble of The Anthropologists and directed by Melissa Moschitto, takes place in three parts. Part 1 begins simply with a gentleman in a suit giving a lecture. This is famous writer Aldous Huxley (Brave New World), talking about climate change. He speaks to the fact Humans, he says, live on the earth like parasites. We need to take responsibility and make the world a better place. After quite a long span of time, an eclectic group of individuals walks into the room for a scheduled support group for quitting smoking. Each of these strange people has their own issues. One is a college student named Linden (Marianne Hardart) who slathers her arms with hand sanitizer. Another is Karma (Michael Ables), a yoga teacher in overall shorts. Then there is no-nonsense businesswoman Edna (Jean Goto). Eventually a final member of their group, Jeff (Mark Cisneros) arrives, a middle aged man who is all about rock music and lives with his mom. While all of these people are going through their push and pull of wanting cigarettes while knowing smoking is killing them, Mr. Huxley is still lecturing about the potentiality of man (and woman) to change. Part 2 jumps the story to a blackout in New York City. The power grid is down and four people are taking refuge in a basement art studio in Washington Heights. With a stationary bike center-stage, Oscar (Brian Demar Jones), Marion (Mariah Freda), Edda (Brianna Kalisch), and Crocker (Arisael Rivera) take turns powering their own lights and electricity. Of course, complications occur. Oscar is forcing them all to eat tilapia, Marion is pregnant and “training” her baby in the womb to resist the desire for meat, Edda keeps trying to escape, and Crocker is avoiding his turn on the bike while blogging on his laptop. Last is the Epilogue, the most abstract part of the production, left open for much interpretation. Plastic bags are blown onto the stage to show the trash and litter that humanity is leaving. The ensemble stares at their phones while looking up occasionally to film things going on around them. This turns into robots debating what people want and need. Can we change our ways? Do we need to consume the filth and produce more of it? Each summer the New Ohio Theatre presents the Ice Factory summer festival, which “prides itself on maintaining extraordinary aesthetic diversity along with an unequaled standard for intelligent, imaginative theater.” This production definitely falls into those guidelines as they have not only done the necessary research to drive their thought-provoking points home, but they do so in a way that I haven't seen before. I'm still processing all of their commentary on where we are today regarding the use of technology, the prevalence of meat and artificial products, and giving in to temptation when it affects all future generations. Will our waste keep piling up, or will we do something about it? How long can we survive on this planet at our rate of consumption? The Anthropologists Save the World! was created by The Anthropologists. Directed by Melissa Moschitto. Dramaturgy was by Lynde Rosario. Lighting Design was by Ali Hall. Sound Design was by Andy Evan Cohen. Scenic / Visual Design was by Irina Kuraeva. Prop / Costume Design was by the Company. Stage Manager was Tiffany McCue. Assistant Director / Associate Producer was Philip Santos Schaffer. The cast was Michael Ables, Alexandra Bonesho, Mark Cisneros, Mariah Freda, Jean Goto, Marianne Hardart, Brian Demar Jones, Brianna Kalisch, and Arisael Rivera.